As in previous years, we are collaborating with the National Valentine Collectors Association (USA) to highlight an aspect of valentine production. 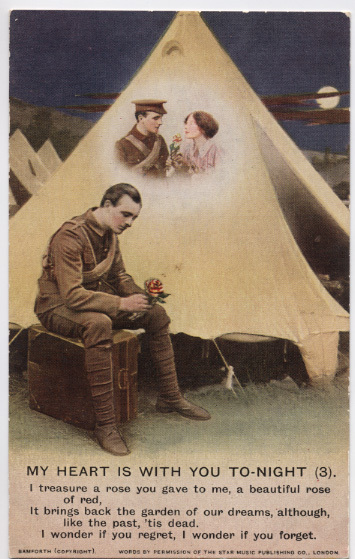 This year, we strike a more sombre note, with valentine postcards from the First World War. This forms part of our commemoration of WWI, mainly through the John Fraser Collection of Propaganda Postcards. Although we show a few examples from the USA, valentines themselves were, unsurprisingly, uncommon in the war years. Instead, separated from their loved ones, men and women sent tokens of love in the form of postcards to and from the trenches to keep their romance alive. Sentimental postcards, often showing couples pining for each other across the miles, were sometimes produced in series, chronicling each verse of a popular song. Woven silk postcards were produced by French women for soldiers to buy and send home. The greetings are by no means confined to valentines, but include birthdays, Christmas, New Year, good luck cards and souvenirs. Pin cushion valentines were often produced by disabled soldiers for rehabilitation. Elaborate designs often incorporated regimental colours.